NaazukSpace: Found it! Found it! A way to save my iPhone from my kid! Found it! Found it! A way to save my iPhone from my kid! iPhones are cool. Super cool. And i heart my iPhone 5! That being said, I have a one year old kid in the house too. Only God saves our phones. 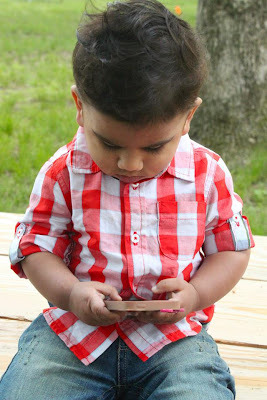 Just like any other kid now, Zidaan has been exposed to iPhone since he was born. No wonder he swipes the lock bar like a Pro. Seriously, you should see that lil finger go 'Woooh' so perfectly. Maasha'Allah! Sometimes I wonder if it's my phone or his. Of course it is mine, that is why he takes the glory of deleting the apps on the phone. I am sure he would have taken care of them if it was his phone. The apps he usually 'uses' is the Race Penguin & Subway Surfers. Maasha'Allah, I was totally amazed one day when he took my phone, swiped across three pages of apps, and clicked on the Race Penguin app, Clicked on 'Play' and rotated the phone to the game mode!!! If that wasn't enough, he finishes the game and clicks on the 'Restart' button and plays again! No! He wasn't just messing with the icons, he actually did that repeatedly. I even gave him a little test just to make myself believe, by getting the phone back to the Home screen and saw what he would do next. And yes, he did the above steps again. I'm REALLY not a fan of giving kids A LOT of screen time, i.e time to spend on Screens, be it Phones or TV. I try my best to limit his use of these devices as it's not something which kids should be glued to. But sometimes when i don't have any option, i do allow him to do it. I make sure he stays on one app for sometime at least so that i can quickly do my work. He does take the phone, but all he does usually is to click on apps, stay on it for 5 seconds and click on the Home button. And next his favorite part, keep his finger on the home button until the apps start dancing and then 'Delete'. Every night before i go to bed, I have to re-install the unfortunate apps which didn't make it through Zidaan's mercy. And every time I whine, why hasn't someone invented some app for the phone to be kid proof or a pass code on apps so that they can use the phone normally while important apps be password protected. Last evening was one such evening once again when Zidaan took my phone, kept on switching between apps and pressing the home button a zillion times. I was so fed up and asked Zu to invent an app which would help me save my phone! Zu said I'm sure there is something out there as every parent faces this similar problem. But yes, if it is around already, i bet it isn't toooooooooo popular cuz I haven't heard anyone mention about it or Maybe it's just me. So there i was Googling about some tips to having your kid use the Phone without cleansing it. Click. You don't know my son. This might work!! Found out a way to keep the kid away from clicking on the home button and staying on one app until we desire! Is this for real?! Let's try it out. I follow the instructions and give the phone to Zidaan. And Boom!!! We won this time!!! I can't express the happiness I experienced when it worked! So here it is for those of you who don't know it already! 1. Go to the 'Settings' app on your iPhone. 2. Click on the 'General' settings. 6. Set a Pass code. Now go to any app which you want your kid to stay on, Triple tap the home button and you will see a pop-up on the top of your screen asking if you want to start a Guided access session. Happily click on the 'Start'. And there you are ready to win the battle with your kid. Once your kid is done playing, or like in my case- your work is done, Triple tap again and click on the 'End' guided access session but this time since the guided access is turned on, you have to in your pass code. Once that's done, you are able to click the home button and return to your home screen. It's said to work on the iPad too. How could I have ever doubted Apple's programming capabilities. May your soul RIP Mr. Steve Jobs. One con in this settings is that you can't answer calls while the guided access is turned on, though you get to see the miscall once you are out of the access mode. Your call is sent across to Voice mail.